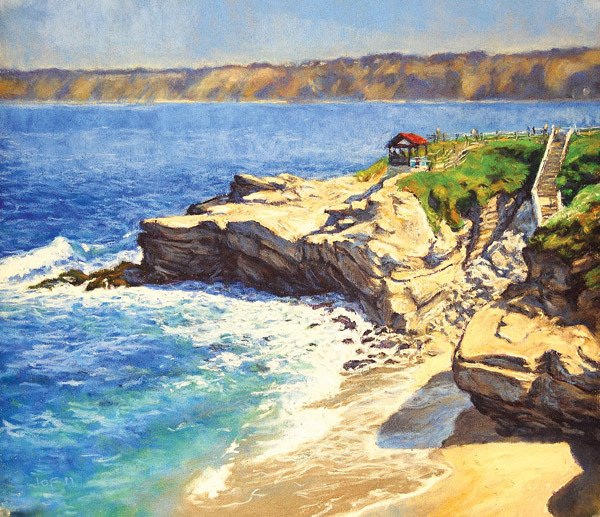 “Shell Beach” is a view of the area south of La Jolla Cove. Local artist Jeffrey Olsen Field is often found behind a canvas overlooking a scenic spot in San Diego. With a pastel stick in hand, Field creates traditional pastel paintings of land and seascapes in his studio and en plein air, a French phrase to describe the act of painting outdoors. When he’s inside, his paintings are based on photographs he took. From Torrey Pines, Sunset Cliffs to La Jolla Cove, Field captures picturesque scenes that define the area. His paintings are not striking in character but rather depict the calm serenity of the natural world around us, even harmoniously infusing simple elements of urbanization. Field has also painted landscapes of Santa Barbara, Hawaii, Tucson and the San Juan Mountains in Colorado. “Our local landscape is so inspiring almost every day,” Field said. 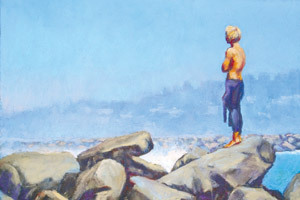 “But I do go out and I love to hike in the backcountry, in the Sierras and in Wyoming – in fact, anywhere there are mountain and desert scenes that inspire me.” His works of art, which range in price from $75 to $750, are mostly landscapes but also include people within landscapes and still life paintings. “The paintings are just reflections to show the beauty or brightness of the world,” Field said. Field, originally from New Jersey, practiced architecture in Missouri and then in California until 1997, when he decided to become a full-time artist. He now resides in Ocean Beach. He worked as an architect for almost 20 years. Field was involved in various major architectural projects around San Diego. Notable projects include the renovation of College Grove Shopping Center, Santee Trolley Square Santee, Campus Marketplace in San Marcos, the new Poinsettia Elementary School in Carlsbad and the new Mission Vista High School in Vista in 2005. “I have always enjoyed the graphic arts. I’d done a little bit of painting on the side and I just felt drawn to that, so I decided to pursue that route,” Field said. 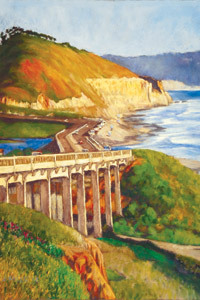 “Old Bridge,” a view of Del Mar State Beach, exhibited at the 2012 La Jolla Art and Wine Festival. In addition to using pencils and brushes from his trained profession as an architect, Field also works with traditional kaolin-based soft pastel on sanded paper to create his pieces. This material, easily smudged and blended, creates vibrant colors. “I like the traditional pastel for its flexibility and strong colors, whereas sanded papers allow more layers to be applied than unsanded,” Field said. Field’s work has been exhibited at the San Diego Art Institute, Southwestern Artists Association, ArtWalk in Little Italy, the La Jolla Festival of the Arts, the San Diego County Fair and La Jolla Art and Wine Festival. 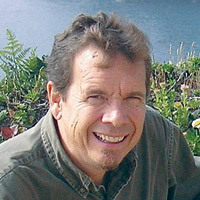 Since 2006, San Diego Art Institute (SDAI) has juried over 12 of Field’s pieces for SDAI’s regional and One Foot shows. About five pieces of his work are displayed at SDAI’s gallery, which is next to the Mingei International Museum in Balboa Park. He has received various prizes from local shows, such as two third prizes in 2008 at the Southwest Artists Association 7th Annual One Foot Show and the Plein Air Painting Competition at the San Diego County Fair. In 2010, Field received an honorable mention at the Art in the Pines Plein Air at Torrey Pines State Reserve. His artwork will be on display at the upcoming Art in the Pines show in May. To learn more about Field, visit jeffreyolsenfield.com. 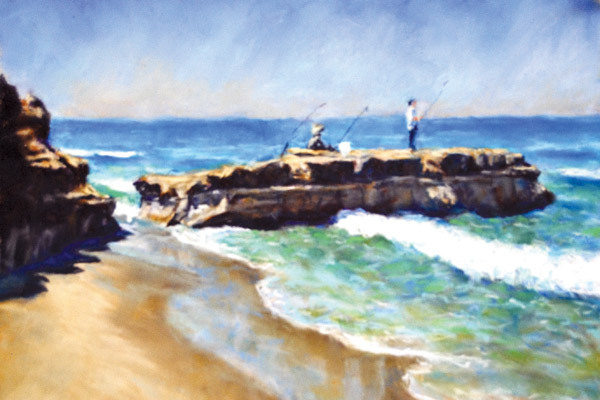 “Flat Rock Fishing” painted en plein air at Torrey Pines State Reserve. 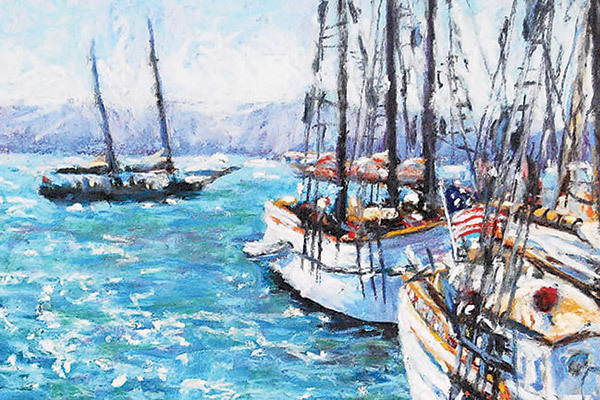 “Festival of Sail 2008” is a plein air painting completed in summer 2008. 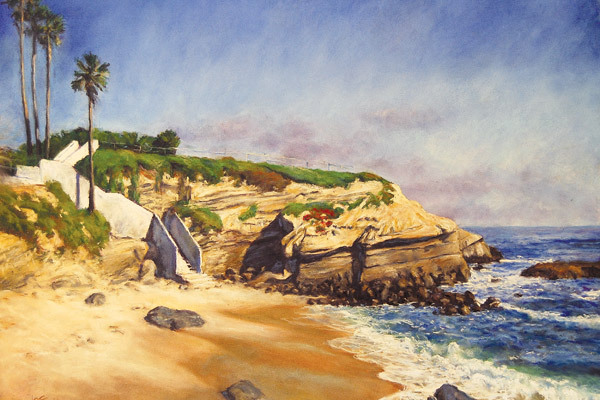 “Cove Beach” was painted in studio in 2011 and exhibited at La Jolla Festival of the Arts and San Diego Art Institute.